Partly cloudy. Gusty winds in the afternoon. High 82F. Winds SSE at 20 to 30 mph. Higher wind gusts possible..
Isolated thunderstorms during the evening, then cloudy skies overnight. Low 61F. Winds S at 10 to 20 mph. Chance of rain 30%. The 17-acre grounds of the North 37th Street pumping station made up Water Works Park from 1911 until the facility was closed and the land sold for private development in 1952. The site of Ranks Department Store became Pride Park after the store was destroyed by fire in 1970. The adjacent former Broadway Theater was The Pantry restaurant when this photo was taken in 1973. Though Carr Lake dried up in the 1950s traces of it can still be seen from the air today (circled in yellow). Note the Missouri River and Lake Manawa in the background. Macrae Park served the dual purpose of providing an attractive entrance to Council Bluffs for travelers from the east and saving on paving costs. Bayliss Park, Fairmount, Big Lake — you’ve likely been there. If not at least you’re familiar with them. Other parks never became household names and in some cases haven’t even withstood the test of time. Early Council Bluffs was a rugged town, but the need for relaxation wasn’t lost on civic leaders. Believing “buried deep within the soul of every dweller of the city lies an inherent desire to rub elbows with nature” Council Bluffs boasted that it had more public park land than any city of its size in the United States. In 1879, park commissioner Andrew Graham became impressed with a tract of land he hunted on about 4 miles south of town. With the city park network always on his mind he envisioned this property as the southern anchor of Council Bluffs’ park system, possibly even turning it into a resort. As the property was within the meander line of the Missouri River the federal government held title to the land. Local congressman Col. William Fletcher Sapp introduced a bill giving 72 acres of the land to Council Bluffs, including Carr Lake, through a special act of Congress in 1880. Thirty acres of adjoining wooded property was purchased by the Board of Park Commissioners bringing Island Park to 102 acres and establishing it as the third largest park in the Council Bluffs system. Both Island and Lakeview Parks were unique in that they were city parks yet outside the city limits. Island park was on the Chicago Burlington and Quincy railroad line and while it attracted some picnickers and sportsmen from the city most of the eyes that feasted on it’s beauty were likely those looking out through the windows of C.B. & Q. passenger trains. Island Park was never developed by the city. While the exact reasons for not developing the park are unclear, likely factors include the silting in of Carr Lake and the development of nearby Lake Manawa which didn’t exist at the time Park Commissioner Graham envisioned Island Park as becoming a resort. Today, the traveler on Interstate 29 passes just a few hundred yards from Carr Lake, though there is no longer any water to be seen. Water Works Park on North 37th Street at the river was a favorite for bird watching, organization picnics and neighborhood kids. The 17-acre park adjacent to the water works pumping station was not a part of the city park system; recreational facilities were provided and maintained by the West End Improvement Club. In 1950, the club petitioned the city to add the park to the city system, saying costs of maintaining it were becoming too big a burden for the club. As it turned out the park’s days were numbered. 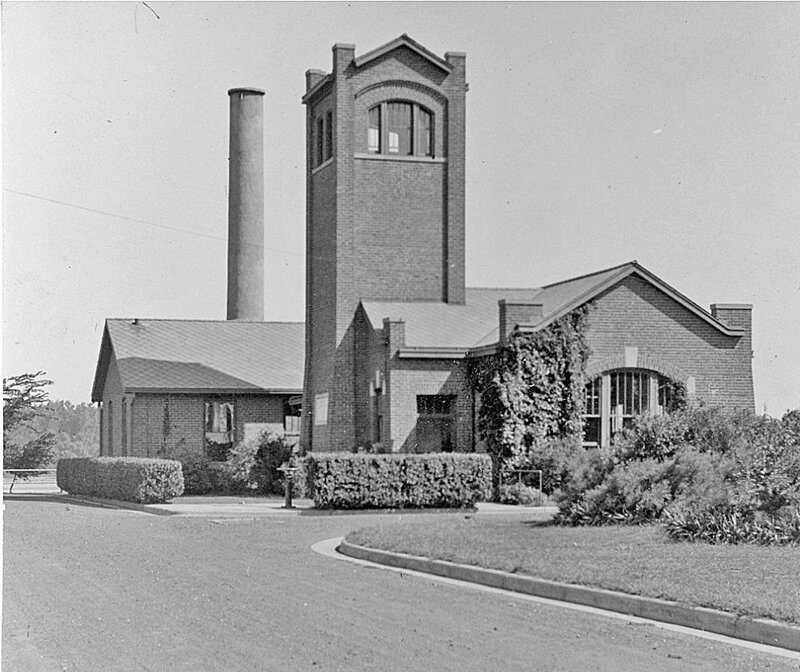 A new water works plant with modern technology opened in 1952 on North 25th Street and the department declared the property surplus. In 1953, the board received two bids for the property, one from Abe Slusky, operator of the adjacent Playland Park, and one from Joseph B. Katelman. Though the winning bid of $17,000 was less than the $25,000 appraised value Water Works Park was sold to Katelman who announced plans to use it as a house trailer park. Mid City Trailer Village opened a short time later retaining some of the park’s features. The trailer park operated until 1965 when the interstate highway cut through the land, eliminating the last traces of Water Works Park. More often than not creating a new park costs money. An exception would be Macrae Park which came out of a desire to save money. When paving was planned for the eastern portion of Broadway it was noted the intersection with Oak Street was one hundred feet wider than it needed to be. Rather than the expense of so much concrete a park triangle was created at the intersection featuring flowers, shrubbery, and blue grass sod, “providing an appearance pleasing to the traveler entering the city from the east.” It was named Macrae park in honor of mayor Dr. Donald Macrae, Jr.
Ripley’s “Believe It or Not” once credited Council Bluffs as having as “the world’s smallest organized park” — Sloane Park at Bryant and Vine Streets. The 32-square foot park was created when workers cut one corner of a wall near the old police station short, leaving an ugly triangular plat. Police jailer Thomas Sloan loved flowers and started planting them there; when he died in 1937, the area was named for him. The Omni Center occupies the site today. Friendship Park was born from an early 1970s riverfront development plan. The Corps of Engineers built picnic shelters and restrooms along the river just south of West Broadway; the city added campsites with water and electricity. Though proposed as Landmark Point the name Friendship Park was adopted due to its proximity to the proposed bicentennial Friendship Fountain. The fountain never materialized and the park became part of the riverboat casino development in the mid 1990s. Morgan, Houston, Keeline and Kenmore Parks still exist though their official names have fallen out of usage. Morgan Park was acquired in 1915 and was created by the circular street called Park Avenue in the Hillcrest Addition. A loop of Houston Avenue encircles three tenths of an acre of land making up Houston Park. In 1923, the city acquired two triangular tracts created by the curved intersections of Keline and Kenmore Avenues, providing the bits of land named Keeline and Kenmore Park. Pride Park is likely Council Bluffs’ shortest lived park. The city planted flowers and landscaped the site of Ranks Department Store, creating a downtown green space following the fire the destroyed the building in December 1970. The area became part of the downtown urban renewal project a few years later. — The Historical and Preservation Society of Pottawattamie County can be reached at information@TheHistoricalSociety.org.